Itoman Fishers Restaurant that received the JCD Design Award and Good Design Award for fiscal 2013. In the Nishizaki district, Itoman. Itoman Fishers Restaurant in the Nishizaki district of Itoman received the JCD Design Award and Good Design Award for fiscal 2013. In the fishing village of Itoman, the locals used to build their houses by loading up coral limestones. The architect of the restaurant designed the building in the style of gusuku or castle, using Ryukyu limestone and coral limestone. The parents of Tamashiro run a fish store. 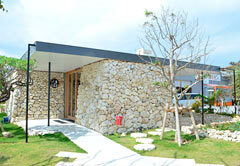 To tell fisher culture of Itoman, called “Home of Uminchu (fisher),” Tomashiro opened the restaurant in February 2013. The restaurant offers fresh fish and creative cuisine arranged from the fish soup the fishers used to eat. Yamazaki Kentaro Design Workshop of Tokyo designed the building. The Japan Commercial Environmental Design Association created the JCD Design Award in 1974. It aims at rewarding interior design. The Japan Industrial Design Promotion Organization hosts the Good Design Award. It seeks to reward good designs, including engineering products and software.